Maybe you’re like me when you think of Israeli food—a toasted pita filled with falafel, couched in an Israeli salad of freshly diced cucumbers and tomatoes drizzled with tzatziki sauce (I’m making myself hungry!). While this may be very vegan and very popular fare in Israel, celebrating a holiday by grilling meat on the barbecue is as traditional there as it is here, on Memorial Day or the Fourth of July. Last month, on Israel’s 65th birthday, thousands of Israeli’s gathered in parks and open green spaces around the country to barbecue meat in celebration of the national holiday. Sound familiar? The popularity of barbecuing on this day of the year and the predominance of grilling meat became so strong that about ten years ago, the holiday was nicknamed “Hag Hamangal,” or the “holiday of the barbecue.” Sound familiar? As different as our cultures are, Israel and America both seem to have made cooking meat on the barbecue the center around which warm weather holidays revolve. How many hot dog and hamburger magazine covers have you spotted in the last few weeks or how many TV chefs have you seen demonstrating their latest recipes for grilling all kinds of meat ? Omri Paz is trying to change all that in Israel! 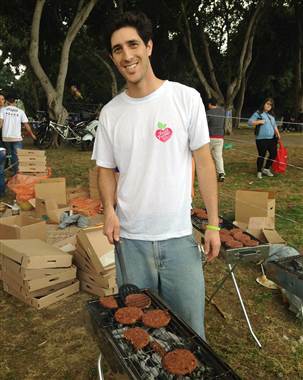 Paz, a 30-year old Israeli vegan from Tel Aviv, has started an organization called Vegan Future. 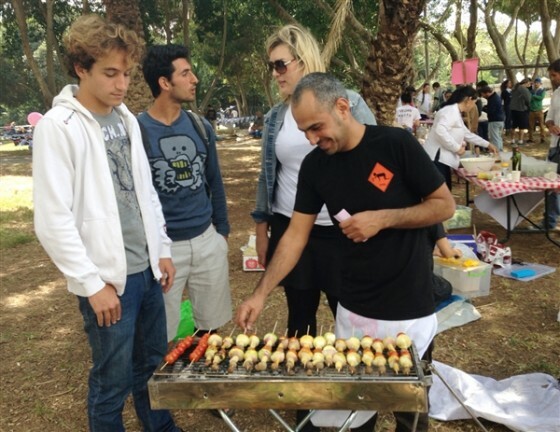 This non-profit organization, led by Paz, set up a massive area in Yarkon Park in Tel Aviv on this year’s Independence Day holiday completely devoted to raising awareness of the benefits of eating plant-based diet. While everyone around them traditionally grilled meat, Vegan Future grilled only tofu, veggie burgers and vegetables. Paz estimates that about 400 people came to his vegan barbecue this year and he hopes that next year will see around 2,000 participants. 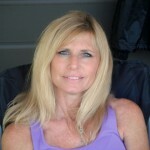 A lecture educating about the cruelty to cattle was also given at the barbecue, amongst balloons and posters of a woman hugging animals. Not only were no animals consumed during Omri Paz and Vegan Future’s event, but people who normally feel left out, offended or just stay home felt part of the celebration. They also felt they were making a strong statement of veganism in a sea of carnivorous eaters. Ellen Francis: Do you think Israel is basically a meat-loving culture? How do you see it changing in the future? Omri Paz: Israel is definitely a meat eating country. We look for every occasion to celebrate by eating huge amounts of meat. A great example is Israel’s Independence day which became the national BBQ day. On that day, literally everyone goes out to the Israeli parks and eats meat. Chicken breast is extremely common (probably cause it’s the cheapest). About 60-75 percent of all the meat that’s consumed comes from chicken. Until the 1990’s, it was rare to find pork meat (not kosher) but now after the Russian immigration even that became extremely popular with about 150 k pigs being slaughtered every year. EF: How did you start your organization, A Vegan Future? EF: Do you find the people in Israel open-minded to veganism or reluctant to try it? OP: I think that until last year, there wasn’t any awareness towards veganism and vegans but in the last 2 years something amazing happened. Veganism became mainstream. It’s everywhere. There’s lots of vegan menus in restaurants, articles and items in the media. 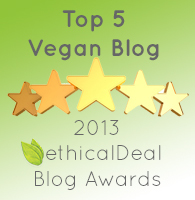 And overall, I can say that there is a big acceptance towards vegans and their lifestyle. Almost everyone has a vegan friend or a vegan family member. On the other hand, since the meat culture is so dominant, 90% of the population can’t even imagine their life with out meat. Therefore it’s very difficult to convince people to stop consuming animals. EF: What are some good vegan restaurants in Israel? OP: First of all, it’s important to know that since Israel has so few restaurants that are 100 % vegan, we, in the vegan friendly project, made a new category of vegan friendly restaurants. Those restaurants are not completely vegan but provide lots of vegan options. Usually they even have vegan menus. The best vegan pizza in Israel is, without a doubt, Pizza Olio. It’s so good that its worth driving all the way up north just to taste it. Great vegan ice cream is found at Icecream Gela, in Rehovot and Ramat Gan. EF: Do u have any opinion on being kosher and being vegan? OP: Sorry, I’m an atheist so I don’t believe in god or in kosher….But I do know that since vegan food does not have dairy products nor meat then everything that you eat as a vegan is supposed to be kosher. From the sound of Paz’s goals and mission, Israel has a passionate champion of veganism in their midsts. Vegan Future has an active Facebook page. It’s great to hear that vegan options abound in restaurants there and that Israeli’s are pretty open to plant-based nutrition when it is made available. If Israel is on your travel list, please check out some of these restaurants and let me know what you think! As we head into the summer season and barbecuing becomes a weekly event, we will explore more vegan cooking options here at Vegan American Princess. We can change the way the grill looks on the Fourth of July and make it similar to the grills in Israel on their Independence Day! Thank you Omri Paz for furthering our worthy cause and promoting veganism! Omri Paz exemplifies Maya Angelou’s statement that “when you know better, you do better!” I have seen some of Garry Youropsky’s inspirational videos and they are amazing. What is more amazing is the action taken by Mr. Paz to create Vegan Future after watching one of Mr. Youropsky’s lectures. I sincerely hope that next year’s vegan barbecue has Mr.Paz’s expected 2,000 visitors. That would be progress! 1. No one in israel uses tsazhiki in a fallafel dish. We use a thin tahini sauce. 2. You should probably know that tsazhiki is not vegan! (Yoghurt). 3. The organization founded by omri is called “vegan friendly” not “vegan future”!